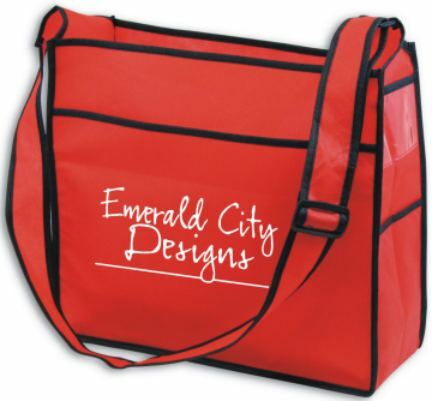 Personalized Fashion ID Bag -Stylish Tote for Tradeshows, Custom Printed in Bulk. Promotional, Inexpensive. Best Price in USA, Canada: Overstock Sale! Black, Red, Royal Blue, White. Wholesale personalized recyclable fashion tote bags with clear I.D. Holder -Business Card Holder. Ideal for Tradeshows. Our sturdy stylish bag is availabe in Black, Red, Royal Blue and White. We also supply wholesale blank (not imprinted) fashion I.D. bags for $2.11 each. Budget Prices in the USA and Canada for personalized fashion bags with I.D. holder. American clients pay no taxes. We will send you a proof for your approval before production. Unit prices below include your 1 color, 1 location custom imprint. .
Additional Imprint Colors: Add $0.45 per tote bag. Colors: Black, Red, Royal Blue, White. Fabric - Non-Woven Polypropylene 80GMS with the feel of cloth.